Exclusive: Check out Katelyn Mallone's Brand NEW videos on YouTube! 1. Wikipedia contributors. "Cervical dystonia." Wikipedia, The Free Encyclopedia. Wikipedia, The Free Encyclopedia, 29 Oct. 2007. Web. 1 Dec. 2010. A grass roots coalition started by Katelyn Mallone in hopes of finding a cure for Dystonia as well as bringing awareness to this rare, yet powerful neurological disorder. Here is my latest artsy advertisement postcard! As a spokeswoman I am on a mission to bring understanding and awareness to a rather unknown disorder that has very powerful and at times debilitating symptoms. While this is a very rare disorder, I pledge to bring awareness "1 step at a time." The more people who are aware of this disorder, the sooner Dystonia sufferers will be correctly diagnosed, thus helping scientists find a cure for Dystonia sooner rather then later. My first major opportunity I've had since establishing my Dystonia Awareness Campaign is getting my first article "A Proper Diagnosis Was Music To My Ears" published in Dystonia ST magazine on April 27th, 2011. For more info check out this link. Stay in touch for up-to-date info regarding my Dystonia Awareness Campaign! Katelyn Mallone was diagnosed with a rare neurological dysorder called Cervical Dystonia (also known as Spasmodic Torticollis). I wrote this synopsis in November of 2008. "I have Cervical Dystonia...but Cervical Dystonia does not have me." On October 7th, 2008 (the day before my 22nd birthday), I [Katelyn Mallone] was diagnosed with Cervical Dystonia. 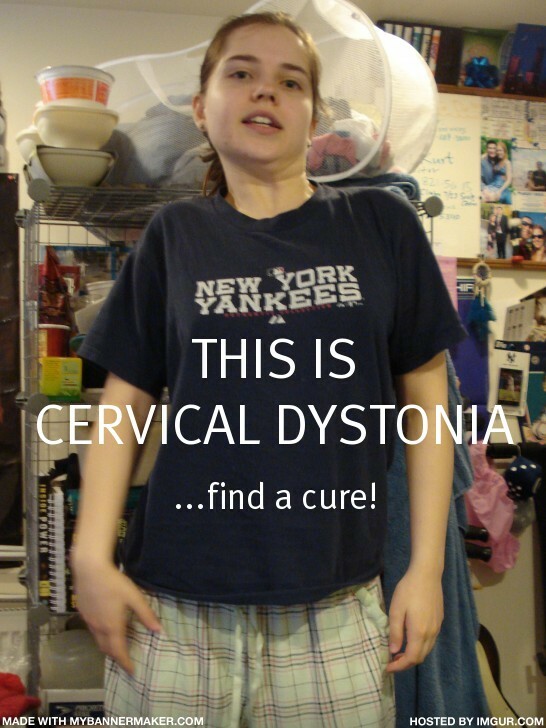 Just what is Cervical Dystonia??? Well, here's the jist of it. My neck muscles are too weak and are unable to hold my head up straight so as a result, my head is tilted to one side. Along with that, my neck muscles are unbearably tight and spasm uncontrollably, causing the upper half of my body to shake (very similar to Parkinson's disease in that respect). There is a treatment for this disorder...but unfortunately NO KNOWN CURE...yet!!! The treatment is a Botox (Botulinum Toxin) injection(s) into the tight, spasmed muscles in order for the muscles to relax. Although this is a treatment, THERE IS NO CURE and I will regularly (every 3-4 months) receive these Botox injections into my neck muscles, as in time, the Botox will eventually wear off. On Oct. 21st, 2008, I recieved my 1st set of injections. There's really no way to tell how much a person needs as it varies from person to person. I was given 2.5 ml (more than average treatment) of Botox into my neck muscles. It takes about 2-4 weeks for the body to respond to these injections. The injections were EXTREMELY painful...but was told by my neurologist that the first set of injections are always the worst. I am NOW taking things into my own hands and am doing INTENSE physical therapy stretching everyday (60-75 min/day) as well as walking (approx 1/8th of a mile/2-3 times a day). My body currently is still tilting to one side and it's incredibly challenging for me to walk around. I'm temporarily disabled for the time being. My torso has been tilted for SO LONG I have to re-train my body to be straight again. Funny to think that I can't remember what it's feels like to stand up straight...I just don't remember, so I am working at that. I have to wait approx 3 months before I can receive my next set of Botox injections, and am scheduled to recieve them on Jan 8th, 2009. I will be receiving approx 3.6 ml of Botox into my neck muscles. After about 3 weeks, if my body responds adequately, I should show significant improvement. But unfortunately will have to live with Cervical Dystonia for the rest of my life. I just want to thank you all for all the prayers and support I have received through this entire ordeal. You are the true heroes and I am blessed to have wonderful, kind, compassionate and caring people like YOU in my life! GOD BLESS YOU ALL and please...keep up the prayers! I'll take all that I can get! Check out my Dystonia Awareness photo album here. I am excited to report that my recovery efforts have drastically improved my way of life. Back in January of 2010, I had a disappointing relapse, thus taking approx 7 months to recover. But thanks to the tools of physical therapy and the wonders of modern medication, my symptoms have been at bay. I find it bizarre that there is a stress element to Cervical Dystonia. I have to work extremely hard to keep my mind and body in a relaxed and calm state. On top of that, I have been vigorous with my physical therapy regiment. Not only do I stretch every day, but I focus on deep breathing, which can really relax me. Last but NOT least, I work on having the healthiest diet I can have. Wih my disorder, I try to eliminate all sucrose (sugar) products, absolutely NO alcohol (because of the medication I am on) and no caffeine products of any kind. And to top that off, I continue to eat foods that are high in fiber. While this is the jist of my regiment, spirituality plays a major role in my recovery as well. Praying for my health, both physically and emotionally has done wonders for my condition. All I can say is how greatful I am that I have been given the tools to help me recover and ultimately lead a "normal" life. I am exctatic to have gone to a rehab clinic and graduate from that same clinic. Even during my last relapse, I would not be where I am today had it not been for rehab. I am blessed and try to count my blessings every day. My Official Ad Campaign To Find A Cure For Dystonia! during the summer of 2009. Copyright . Katelyn Mallone. All rights reserved.